Every spring for the past three years, we have been monitoring the leaf out times of over one thousand species of trees, shrubs, and vines at the Arnold Arboretum of Harvard University. We try to survey the entire collection at least once a week, recording when the first flush of new leaves are produced for each species. The work is important for ecosystem research in determining when the growing season begins, when new leaves are available as food for animals, and when plants start to absorb atmospheric carbon dioxide. This work is also important in determining the ability of plants to respond to a warming climate. And lastly, the variation among species in leaf out is a rich area of natural history that has been surprisingly neglected. At the Arnold Arboretum in 2013, the first plants began to leaf out in mid-March. These were mainly species of honeysuckles (Lonicera), gooseberries (Ribes), and privets (Ligustrum). The last species did not leaf out until 2 to 3 months later, and these were mostly species of pine (Pinus), fir (Abies), and spruce (Picea), along with a few evergreen rhododendrons. 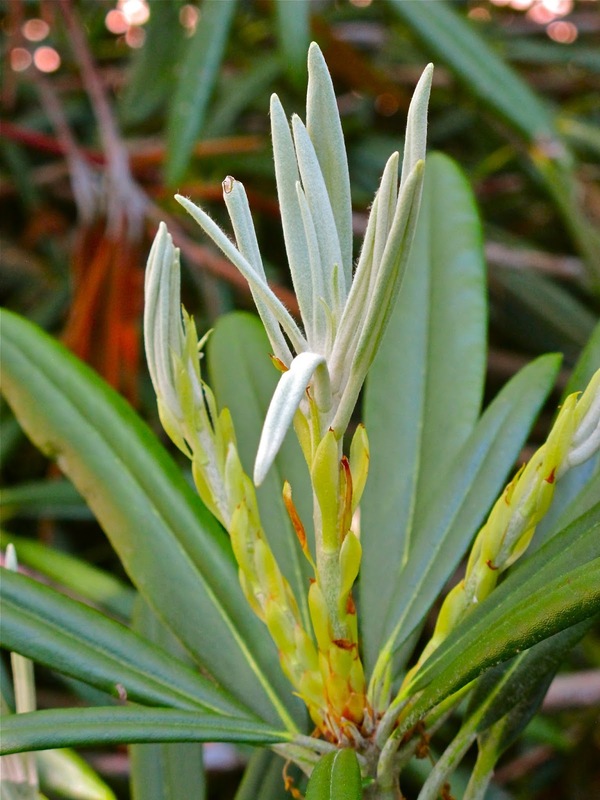 The last species to leaf out at the Arnold Arboretum in 2013 was the Makino Rhododendron (R. makinoi), which did not produce its new flush of leaves until mid-June, three months after the first species. Rhododendron makinoi, the last plant species to leaf out at the Arnold Arboretum. We are currently cooperating with botanical gardens from around the world to monitor leaf out times on a larger scale. Our goal is to determine the relative advantages and disadvantages of early and late leaf out times. Acadia National Park Update: Using transplant gardens to investigate climate change. In Acadia National Park, we are investigating how climate change, and specifically warming spring temperatures, affect flowering times, and possibly the population sizes, of wildflower species. We are currently monitoring flowering times along transects that run up and down the slopes of three mountains, including Cadillac Mountain. On the southern ridge of Cadillac, the transect begins in Northern hardwood forests and climbs through a pitch pine-jack pine community to open granite dotted with shrubby subalpine species. A hiker starting out in a T-shirt will soon pull long-sleeved layers from her pack she ascends into the increasingly cool and windy microclimate above treeline. Later this year we will use a common garden experiment to explore the relationship between temperature and flowering times. To this end, we will create a series of transplant gardens at elevations from sea level through the summit of Mt Cadillac (1500’) using widely distributed species such as Rhodora and Low bush blueberry. Each garden will be filled with transplants from the different elevations in Acadia, as well as plants of the same species from Concord. In these elevation-created microclimates, we can test the roles of local spring temperatures versus the original home of each plant species in controlling its leaf out and flowering dates. 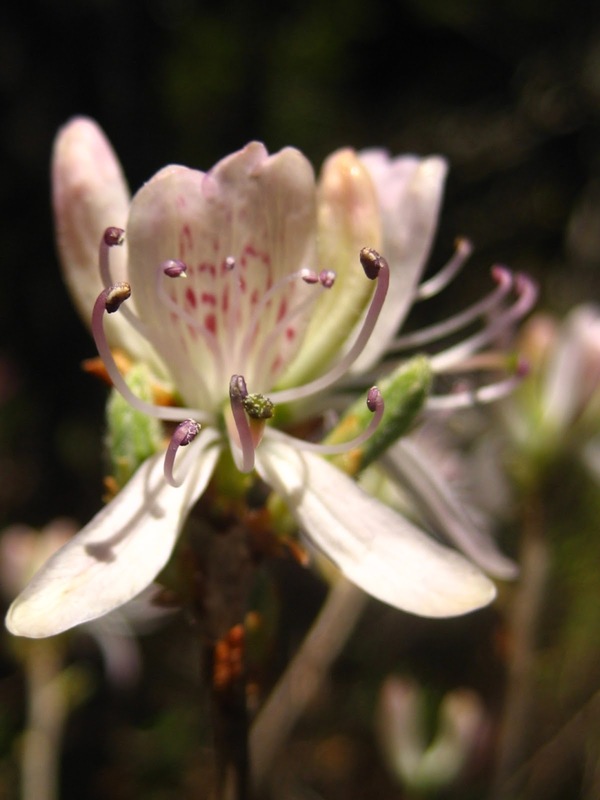 For a certain species, such as Rhodora, if all the plants in a garden bloom at the same date, regardless of their original source, then temperature is a more important factor than where the plant came from and its genetic characteristics. But, if there is a difference among flowering dates of a particular species within a garden depending on where the plant came from, perhaps populations at different elevations (or different locations, such as Concord) have genetically adapted their flowering response in relation to local conditions. We’re looking forward to using the common garden approach to dig into these questions on the interaction of climate change, temperature, flowering times, and local adaptation. When you are in Acadia, please join me for a hike up the mountains!